Face Recognition: Efficiency and Security in a single system. Efficiency and Security in a single system. Face Recognition at a Glance! It can isolate and match hundreds of positions in a given face increasing the recognition true positive rates to over 95%. The software can be adapted to apply this technology to any type of project develop by a private or public organization. The module can also control the recognition threshold to increase or decrease positive rate detection to the desired rate on a case by case basis. 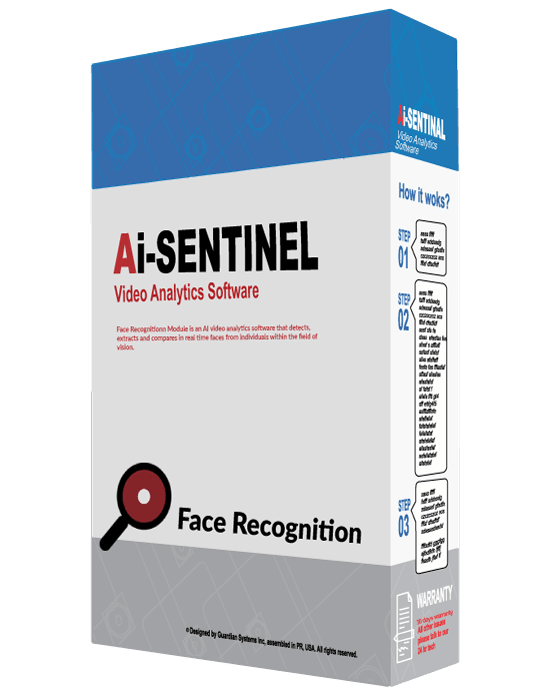 The Face Recognition Module comes with a specially design database that allows the user to create profiles, whitelist, blacklist, and configure recognition thresholds. Ideal for access control, security, risk management and safety, human resources management and much more. ¹Yearly cost. Processing hardware, cameras, labor cost and other hardware are not included and can be quoted separately.Installation costs are quoted separately. Data transfer costs for notifications are not included are will be the sole responsibility of the client. ²Dashboard is made to order with the specific data analysis reports required by the customer and may take 1-2 weeks to compile and confirm from order. Notification functionality may be included in platform parameters. Amount of profiles may affect the true positive recognition rates. High amount of recognition profiles might require out of scope technical support costs. *Face Recognition requires a 6-months software upgrade service. What is the recognition rate? Our recognition rate is over 95% within seconds of detection. We control the environment as much as we can to increase the rate of recognition. We can also control (increase or reduce) the rate of recognition for all the different security and business needs. What is the distance of recognition of a face? It depends on the type of camera. A regular 720p camera will allow detection and recognition at a high rate from up to 6 feet. For more distance we simply use higher powered cameras with more resolution. What can the Facial Recognition Module be used for? This module can be used for access control needs where restricted access is required. It also can log all persons entering a site for business intelligence purposes and can be tied to other modules for double validation.